Sumptuous and decadent, immense and frenetic, Istanbul is “the world in one city”, as it is often described by Western travelers overwhelmed by the city’s splendor. The skyline of Istanbul is punctuated by hundreds of minarets, majestic onion domes, and bell towers. 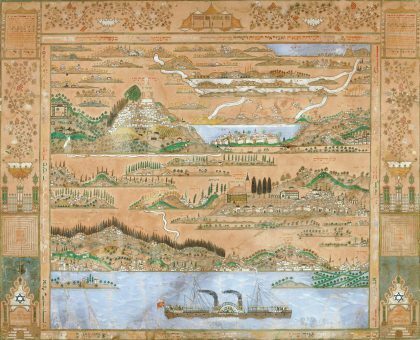 “An aged hand covered with rings held out toward Europe”, according to Jean Cocteau, the great city of Bosphorus mixes the heritage of Byzantium and the Ottoman Empire, of the Orient and Europe. In this extraordinary mixture of the vestiges of centuries, the Jewish presence can appear quite discreet. There are hardly more than 20000 Jews in Turkey today, a drop in the bucket compared to the 12 million inhabitants of Istanbul. The Jews, like all the inhabitants with old roots here, are drowned out by the mass of Anatolian immigrants that have streamed into the city in the last thirty years. More often than not, Istanbul’s Jews speak Turkish among themselves, even if most know French. 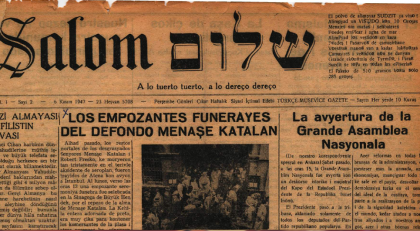 Only the very elderly remember Ladino, their old language to which the Hebrew weekly Shalom (circulation of 3500) still dedicates one or two pages in each issue. The number of kosher restaurant can be counted on one hand and are often located in hotels for Jewish tourists passing through. Of the sixteen synagogues still in existence, only a handful are active. Shiviti (decorative plaque) depicting a map of Jerusalem, eastern wall of a synagogue in Istanbul, 1853. Jewish Museum, New York. Although Turkish Judaism and its monuments and cemeteries were spared the Shoah and the devastation of Nazism, real estate speculation and grand-scale urban renewal projects have destroyed a number of memorials. A highway passes through the middle of the old cemetery of Hasköy atop the Golden Horn. The sumptuous tomb of the Camondo family is thus surrounded by the roar of traffic. Jewish Istanbul still exists, however. One sees it in the summer when Jewish families, most now dispersed in different parts of the city, run into each other at Büyükada (Prinkipo), a traditional vacation spot on the largest of the Princes Islands in the Sea of Marmara. Prosperous merchants, businessmen, famous industrialists, and reputable doctors, Istanbul’s Jews have almost all forsaken the former judería (Jewish quarter) of Balat, Hasköy, Kuzgunçuk (on the Asian side), and even the European old town next to Galata and Beyoglu in order to settle in the new residential neighborhoods. Still, fascinating vestiges of Istanbul’s secular pluralism remain. Less visited by tourists than other European cities, Istanbul’s monuments are no less moving. As Esther Benbassa has written, “These streets have their own language, and in them history is preserved”. Visitinh Jewish Istanbul merits at least two days. It is necessary to contact the Foundation for the Rabbinate’s Synagogues at least twenty-four hours in advance for reasons of security and because many places of worship are closed. We have divided the tour of Istanbul’s Jewish heritage into four large zones. There are synagogues in several Turkish cities beyond Istanbul. Although in ruin, some retain their original splendor, as for example the synagogue at Edirne, a large city on the Bulgarian border where the Jewish community was particularly influential. In southwestern Anatolia, in the impressive remains of the Lydian city of Sardes (fifty-six miles from Izmir), you can explore the ruins of an ancient synagogue dating from the third century. Sardes was the former capital of King Croesus, who was defeated by the Romans in 133 B.C.E. The wealthy port of Izmir (formerly Smyrna), a bustling center of Jewish life during the Ottoman Empire, still has a half dozen interesting synagogues, of which the beautiful Giveret (Senoria) is one. Constructed in the sixteenth century under the sponsorship, it is said, of Dona Gracia Nassi, the aunt of the famous Joseph Nassi, it was remodeled following a fire in 1841. The Shalom Synagogue and the richly decorated Bikour Holim Synagogue are also noteworthy. In the latter, be sure to admire the niche ornamented with magnificent paintings above the tevah.